“The business models for journalism are a real challenge,” Jimmy Wales, co-founder of Wikipedia told us. As it becomes easier to disseminate information, so the pressure to generate more of it at a faster rate grows. One result of that conundrum has been the rise of ‘fake news’. Even though the idea of deliberately disseminating information that is known to be false has existed for hundreds, if not thousands of years, it broke through into public consciousness last year. An analysis by Buzzfeed found that the top 20 fake news stories about the 2016 U.S. presidential election received more engagement on Facebook than the top 20 news stories on the election from 19 major media outlets. When bored Macedonian teens deliberately create fake news to make some extra cash, and foreign governments use it to change voters’ minds in the French, British and American elections, something needs to change. Earlier this year, we at Impossible Labs were commissioned by Jimmy Wales, to try to come up with a platform that could help combat that problem. In 72 hours. “I could have raised money from Silicon Valley and then engage in a year long massive investment in a priori thinking about a model that might not even be of interest to the public,” explains Wales. As a result, we approached the challenge like a traditional hackathon: limit yourself on time, scope and scale, focusing more on building something that could be validated by the public rather than a board of directors, or even a bunch of designers like us. We effectively had three days to create the nucleus for an online newspaper that could represent an alternative to the ad-driven business models that have contributed to the rise in fake news. This is how we went about it — and what we learned along the way. We already knew there was a dynamic at Wikipedia that has proven to be quite powerful between Wikipedians and the community at large. In fact, when we started looking more closely at the Wikipedia platform, we found there were some 70,000 active contributors who monitor, write, and edit the site every day. The system has lead to a resource that the journal Nature puts on a par with the Encyclopaedia Britannica for scientific accuracy. There is no top-down approach to what stories were written. The community seemed to naturally gravitate towards topical issues on their own, to self-edit, and even improve their own work naturally over time. Wikipedia is built on a bespoke platform, which we didn’t have the time to build ourselves. So we went with WordPress. This allowed us some flexibility to reconfigure the platform to how journalists and the community would engage with it. It also aligned with Jimmy’s own views on using open-source software. Organisationally, we resisted the temptation to create an editor role, to see if the same self-organisation would naturally occur — Wikitribune now has a full-time editor. The above is how the hierarchy of Wikipedia has formed over time. That took years of refinement, which we didn’t have the time to do. The journalists had their own specialisms, and our brief to them was to generate as much content in as many different mediums as possible. Anything from text, imagery, audio or video. Our thinking was to see if there was a natural way of displaying these formats together. More on that later. In essence, our planning was brutally simple: bring in journalists, seasoned members of the Wikipedia community, give them access to WordPress and then watch what happens. We must admit, as a design agency we would have liked to have planned more or took a more strategic approach. But as soon as we started looking at the challenge, we realized it was more of a human problem, not a technical one, and required us to reassess our approach. As such, we opted to be as lean as possible, and not to top load the process with restrictive wireframes or feature sets that we hadn’t proven were useful to the community. As the journalists started to create content, we looked at how we could build features or fields in the backend of WordPress to help Wikipedians and journalists work closer together. One particular field was ‘ask for help’. A journalist could write an article and at a certain point ask for help on a certain subject, to see if any members of the community had the information to hand. But early on, we noticed that when journalists began creating their stories, they weren’t relying or even asking the community for help. One journalist even went so far to say they were horrified at the idea of handing over control to people they didn’t know or trust, and it was something they thought would never work. So we had to rethink how we’d change behaviors. One of the features we love about Medium is the comments feature that runs down the right-hand-side. It changes the nature of comments and we hoped, makes them play a bigger role in how we perceive an article than just sticking them at the end like an afterthought. Genius has a very clever app that lets you comment on any website in a similar way. So we spliced them together to see if this approach might help nudge that relationship between journalists and commenters in a more collaborative direction. As a side note, there’s also a cool little Sidecomment.js plugin on github that could’ve done the job too. As journalists published stories, if someone made a comment, they would be pinged via email that someone had added something to their article. With more time we would have liked to have created multiple different types of comments. For example, if someone thinks a part of an article is biased or needs attribution, it would send different notifications to the journalists. Despite the crude approach, we found this mechanism did start to generate more of a dialogue between both parties. Being a design agency, we wanted this newspaper to look and feel beautiful. But what we learned the more we looked at news, news sites, and even Wikipedia itself, is that design takes a backseat when it comes to the content and the collaboration that came with it. Our egos had to be sidelined. The quality of the news was more important than parallax scrolling or creating a design language. In those 72 hours, we probably had more discussions about the philosophy of what news was, can we ever be free from bias or subjectivity and how disparate groups work together than we did building bespoke applications. What emerged at the end of the 72 hours was a rudimentary platform that did one thing very simply: allowed disparate groups of people — journalists, commentators and readers — to have a dialogue with each other that ultimately lead to increased understanding of not only the world around them, but of each other. Journalism historically has been referred to as the ‘fourth estate’. It’s job was to hold governments, corporations and individuals to account and was controlled and operated by powerful and wealthy individuals. Today, that power and influence no longer resides in the hands of the wealthy, journalists or even the communities that support them. It lies in the gaps in between all of those people. 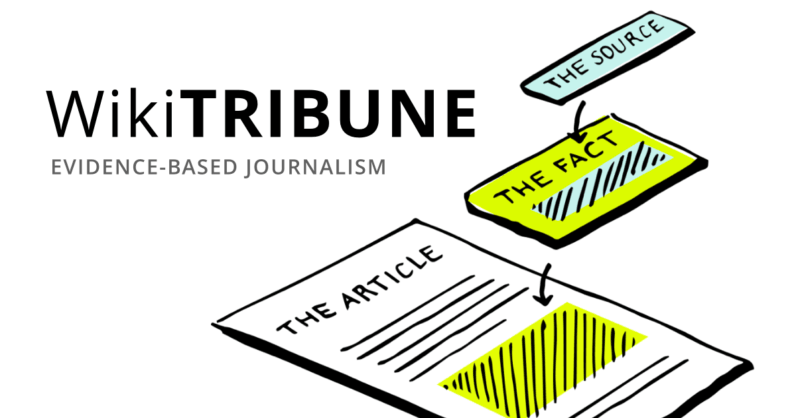 Our approach to Wikitribune was all about making those links more seamless. How to make humans do more together. That may not sound much like what a newspaper looks like today. But we think it’s a glimpse of what they may look like in future.